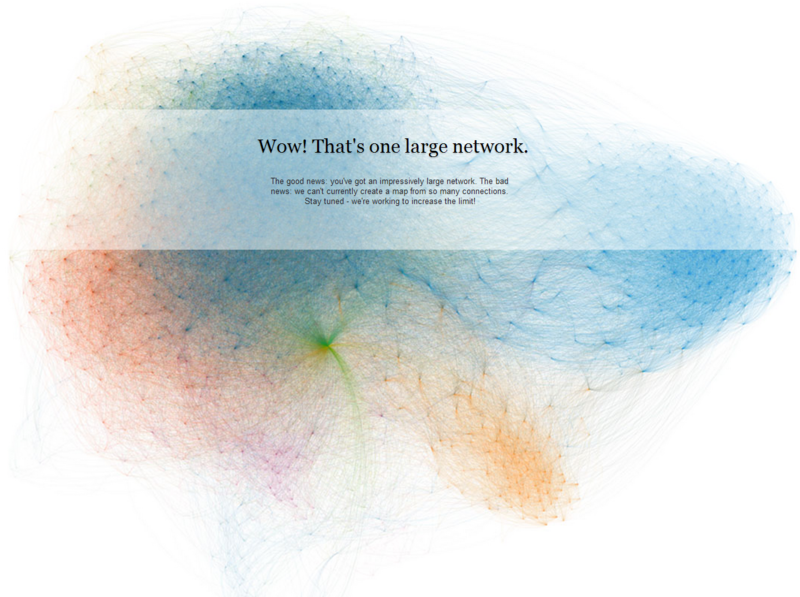 Do you *really* know the size of your LinkedIn network? …LinkedIn has long since removed the “Network Statistics” feature that allowed you to see their estimate of your 2nd and 3rd degree networks. I know I can’t be the only one missing the ability to see LinkedIn network statistics broken down by first, second, and third degree. That’s why I am so I am happy to share some good news – a coworker in the Netherlands recently shared with me that the network statistics link actually still works. Granted, the figures listed for your second and third degree network are only estimates – here’s proof. More on that in a bit. Unfortunately, if your network is quite large, the link might not actually work for you. Sadly, it doesn’t work for me – I get an unexpected error every time. Of course, because LinkedIn no longer supports your network statistics, they can pull the plug on the link I’m sharing with you at any time. If you’re like me and the LinkedIn Network Statistics link doesn’t work for you, there is another way to determine your 2nd degree network. Simply enter a special, non-searchable character (I use an asterisk) in the first name field, select “Anywhere” as the location and hit search. 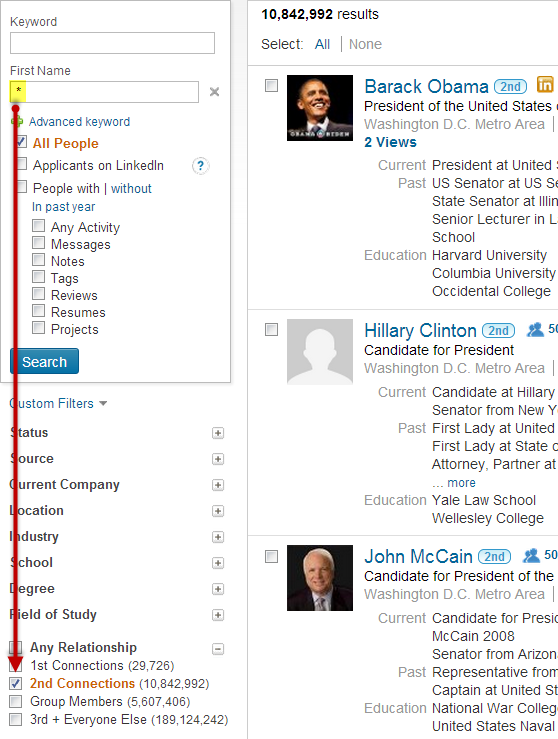 Regardless of the type of LinkedIn account you’re using, go down and look at the relationship facet, and you can see the number of your “2nd Connections” and even your Group connections, although sadly, these are not Group-ONLY connections. Unlike the figures listed in your network statistics, which are only estimates (read further for proof), I believe the number of second degree connections that are shown in the search results above are actual numbers. Unfortunately, your 3rd degree connections are lumped in with “Everyone Else,” so we can’t use this method to divine the size of our 3rd degree networks. If you can’t use the LinkedIn Network Statistics link due to network size (or if LinkedIn kills the link), you can still use your first and second degree connection numbers from the LinkedIn search method shown above to roughly calculate your third degree network, or at least what LinkedIn might estimate to be the size of your 3rd degree network. 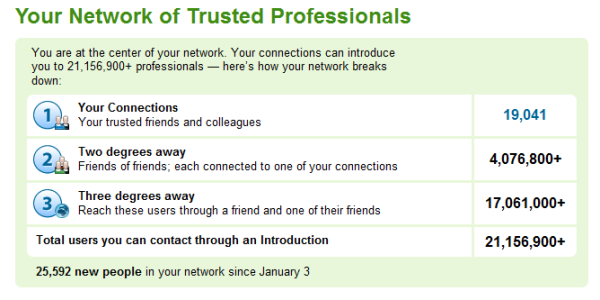 For example, LinkedIn claims my total network size is 30,995,402 professionals. If I take 30,995,402 and subtract my 10,842,992 2nd degree connections as well as my ~30,000 1st degree connections, I get about 20,122,410. Here’s the issue – that seems artificially low, doesn’t it? That leads me to believe that the figure displayed as the number of professionals that LinkedIn claims my 1st degree network links me to (30,995,402+) is only an estimate, and I happen to think it’s much lower than the real number. Even with significant network connection overlap, I don’t see how 10,800,000 2nd degree connections can yield a total network of only 31,000,000 people. Any math/statistics gurus out there care to weigh in? I really would like to hear from anyone who has insight into what a more realistic 2nd degree to 3rd degree ratio would be.